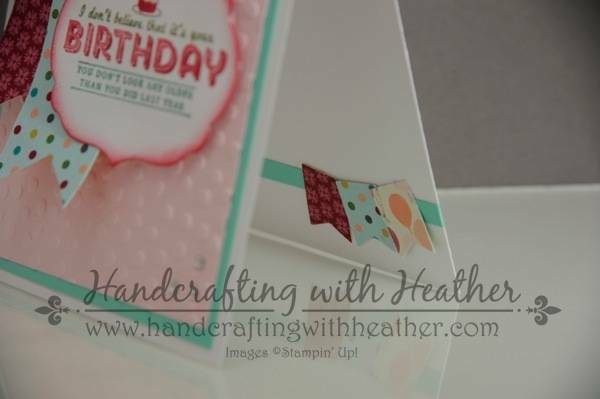 A “See Ya Later” Birthday Sale-A-Bration – Stampin’ Up! Today’s share was created using the See Ya Later stamp set and Decorative Dots (Sale-a-bration items) embossing folder from Stampin’ Up! Both of these items are available FREE with a $50 purchase through March 31st! 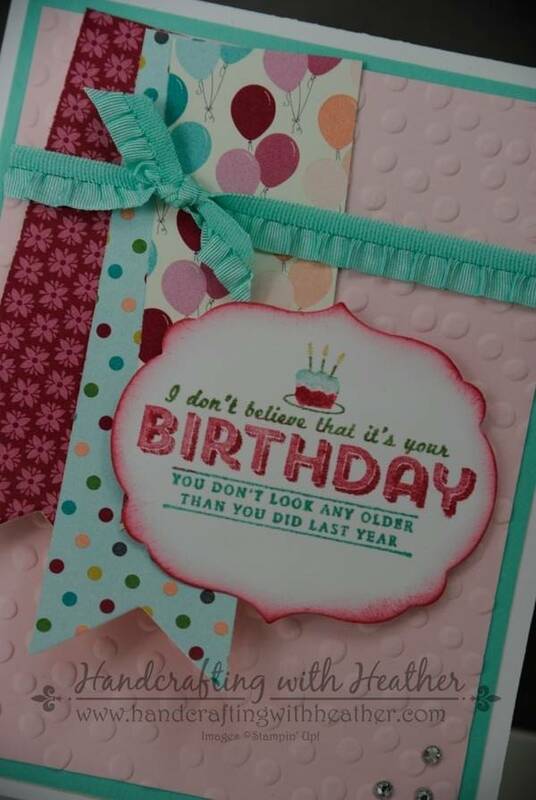 I just love this card! I can’t wait to send it to someone special. 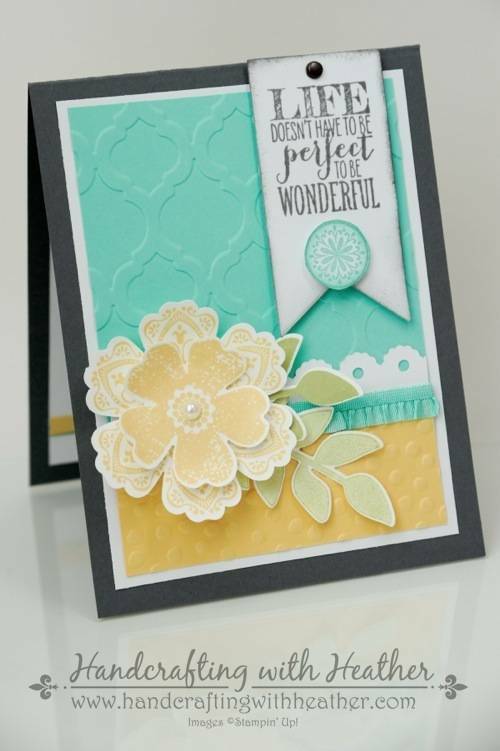 I wish I could take full credit for this cute design, but I actually got the idea from a similar card I saw on Pinterest, created by Selene Kempton. I changed it up a little bit to make it my own, but I want to be sure to give credit where credit is due. I started by cutting panels of Coastal Cabana and Pink Pirouette card stock. 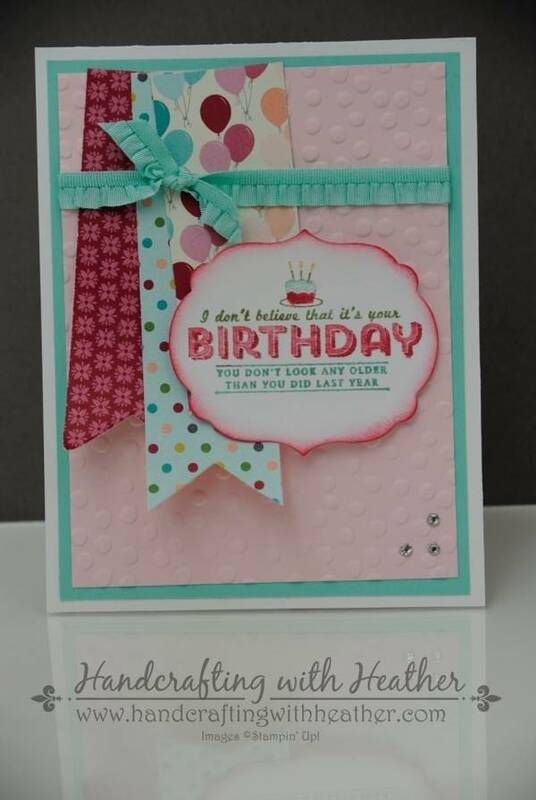 Next, I dry embossed the pink panel using the Decorative Dots embossing folder and my Big Shot Die-Cut Machine. 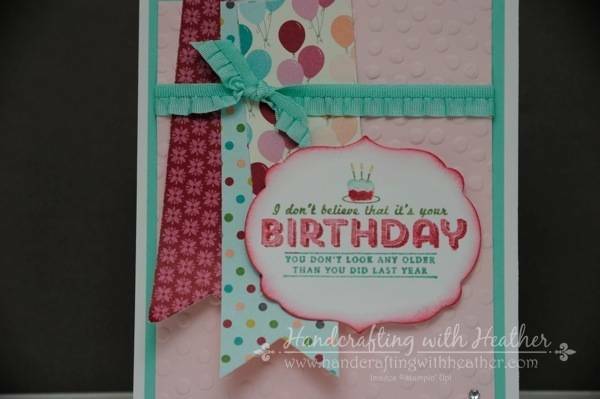 I used the three largest Banner Framelits Dies to cut banners from the Birthday Basics Designer Series Paper. I wanted my banners to be different lengths, but they were too wide for my project, so I trimmed each of them to be 1-1/4 inches wide. Then I adhered them to the Pink Pirouette panel using SNAIL adhesive. I wrapped my pink panel with Coastal Cabana Stretch Ruffle Trim and tied it in a knot. 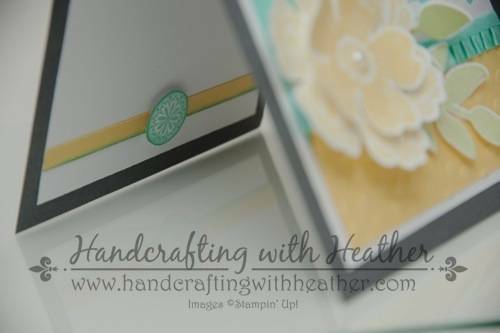 Then I adhered the two panels together and placed them on a Whisper White card base using SNAIL. 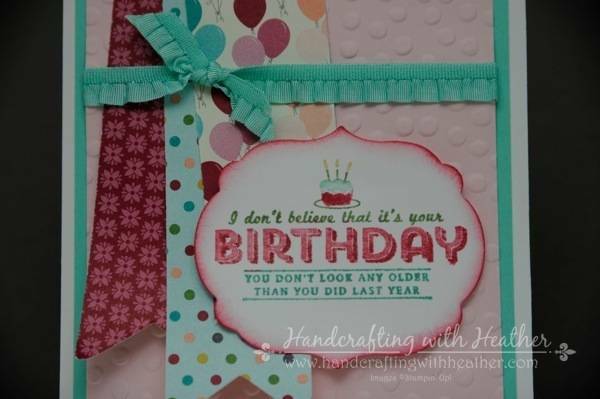 I used stampin’ write markers (So Saffron, Wild Wasabi, Strawberry Slush, & Coastal Cabana) to color the birthday sentiment from the See Ya Later stamp set. Then I used the Labels Collection Framelits to cut it out. 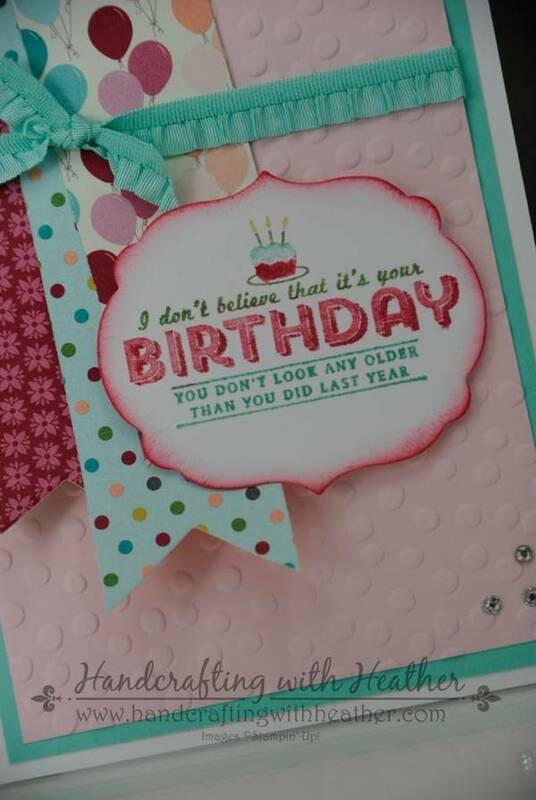 Next I used a sponge dauber to color the edges of the sentiment using my Strawberry Slush Classic Stampin’ Pad and adhered the final product to the card front using Stampin’ Dimensionals. 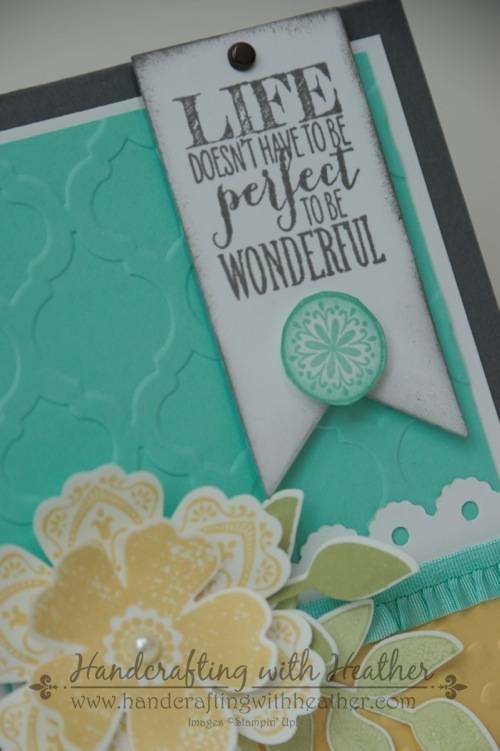 Finally, I completed the front of the card by adding three small Basic Rhinestones Jewel Accents in the bottom right hand corner. 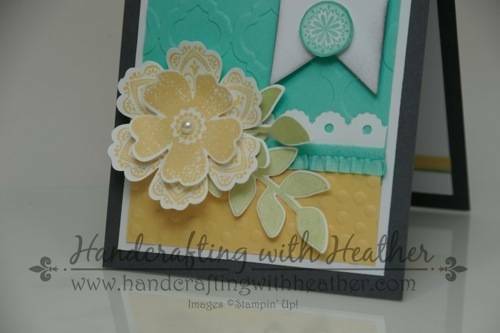 I finished the inside of my card by adding a strip of Coastal Cabana card stock along the bottom. 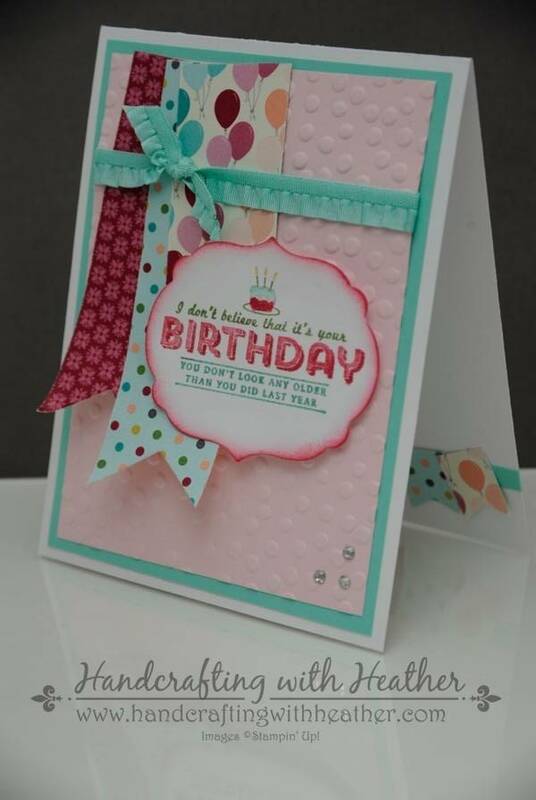 Then I used the banner punch (Sale-a-bration item) to create three small banners using the same Birthday Basics Designer Series Paper which was used on the front of the card. I hope you have enjoyed my share today. I certainly enjoyed creating it. If you would like to place an order and earn the See Ya Later stamp set, Decorative Dots embossing folder, or the banner punch for FREE (Sale-a-bration items), please click here to shop in my online store. Card Stock: Whisper White (100730) – 4-14″ x 11″ card base, one sentiment label (Labels Collection Framelits); Coastal Cabana (130024) – 4″ x 5-1/4″ panel, and 1/4″ x 4-1/4″ strip for inside of card; Pink Pirouette (111351) – 3-3/4″ x 5″ panel.